Women tend to put on weight during menopause for a number of reasons. Although some of the bodily changes can be attributed to hormonal fluctuations, much of it has to do with lifestyle alterations and the natural process of aging, which causes metabolism to slow down over time. It can be upsetting to see the pounds pile on, but losing weight can be done. Read on for advice on how to deal with this issue. Weight gain is often seen as a normal part of menopause, and this is partly due to estrogen fluctuations, since estrogen influences how fat is distributed in the body. However, in most cases, it is not solely because of hormones; as women get older, metabolism naturally slows down, and they tend to become more sedentary. This could be due to physical restrictions or simply a response to the natural drop in energy levels. Weight loss can be daunting at first, but taking it one step at a time and incorporating healthy habits into your lifestyle is a worthwhile process that will help your overall health. Missing out on breakfast means that you could be missing out on essential nutrients and are more likely to snack throughout the day. Breakfast is the ideal time to get some muscle-building protein and healthy fiber in your body that will work to stave off appetite until lunchtime, while giving you the much-needed energy boost to prevent fatigue and difficulty concentrating. In the same vein, try not to skip any meals throughout the day. Plenty of fruit and vegetables are one of the key components to losing weight, as they are low in fat and calories, but high in fiber. Fiber keeps you feeling fuller for longer, so the sugar highs and crashes will be avoided if you snack on these foods rather than chocolate or sweets. The vitamins and minerals they contain will also contribute to an overall sense of well-being and keep you motivated on your weight loss journey. Keeping stocked up on healthy snacks and avoiding having highly processed, unhealthy snacks in the house will reduce temptations to go off track. Exercise is essential for losing weight and keeping it off. Excess calories cannot all be cut through diet alone, no matter how healthily you eat, and it is important to complement a good diet with an active lifestyle. This doesn't always have to mean running the mile every day - most adults are recommended to do 20 - 30 minutes of moderate intensity exercise daily. If you have a physical condition that makes this difficult, it is still worth taking the time to move your body (e.g., doing some gardening, going for a walk, practicing yoga). Find out or consult a doctor about what works best for you and your body. Thirst is often confused with hunger, meaning dehydration can lead to consuming more calories than your body really needs. Aim to drink at least 1.2 liters of water every day, and use it to replace fizzy drinks if you are prone to drinking those. If you wait until you are hungry to make meal decisions, the likelihood is you will eat easy-to-make or grab convenience foods, which tend not to be as nutritious. Plan a week in advance and shop only with a list to avoid those high-calorie impulse buys. Keeping these common-sense recommendations in mind when planning out your weekly schedule will greatly help you put your good intentions into practice. Combining this with a well-balanced diet - and, if needed, a nutritionist's advice - will help you shed away the weight you gained during menopause. 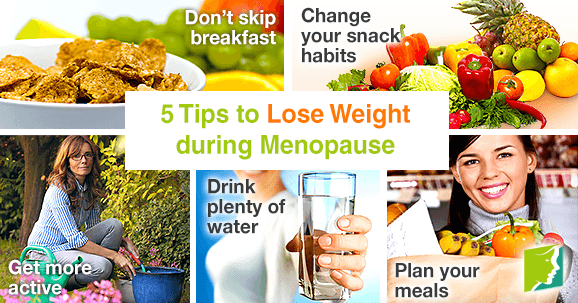 Besides this tips there are also 3 main approaches to handle weight gain during menopause.